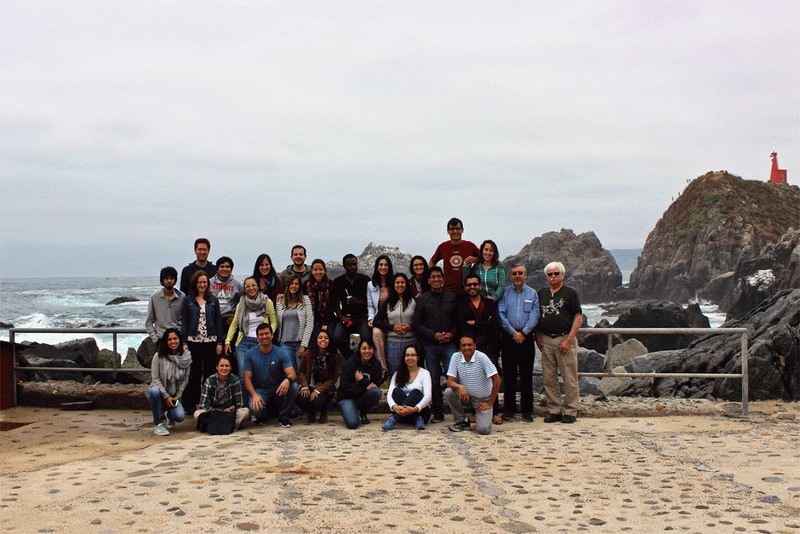 In January 2018, twenty-one graduate students and early career researchers from across South and North America participated in the International Course on Developmental Biology, an EMBO Practical Course held at the Marine Biology Station of Quintay-Chile (CIMARQ). This two-week course was led by eight world-renowned researchers, Drs. Roberto Mayor, Nipam Patel, John Ewer, Raymond Keller, Alejandro Sánchez-Alvarado, Kathleen Whitlock, Claudio Stern and Andrea Streit, many of whom started or currently base their careers in Latin American countries. First offered in 1999, the creation of this course reflected the enthusiasm of Latin American researchers to promote and enhance the field of Developmental Biology in this region by providing an opportunity for young scientific investigators to learn current research techniques and become familiar with model organisms used in this field. A successful outcome from the course was the creation of the Latin American Society of Developmental Biology (LASDB) in 2003, which holds biannual meetings for researchers to disseminate their findings and network with colleagues throughout Latin America. Although the changing political, social and economic climate still presents challenges for young researchers, remarkable progress has been made over the past 20 years. Notably, with several of the recent participants of this course having supervisors who also completed the course earlier in their career, the International Course on Developmental Biology is clearly an important part of the emerging research landscape. For many centuries, Developmental Biology was thought of as a descriptive science. Naturalists dedicated themselves to describing the extensive modifications that occur during the development of various species, characterizing and defining embryo size and shape, as well as the duration of different developmental stages. They addressed fundamental questions that remain to this day: How does a single cell give rise to a complete organism? What are the molecular signals involved? To answer these questions, scientists began using organisms at different levels of complexity, establishing the classical experimental models of Developmental Biology: the roundworm, fruitfly, frog, zebrafish, chicken and mouse, or C. elegans, Drosophila, Xenopus, Danio rerio, Gallus gallus and Mus musculus, as they are affectionately known by scientists. Developmental Biology began to revolutionize in the ‘70s when new technologies such as recombinant DNA became available to study how genes specify different tissue identities. In the ‘80s, we began to talk about homeobox genes, promoters, transcription factors and enhancers, and started using gene expression techniques such as in situ hybridization. As questions at the genetic and morphogenetic level began to be clarified, other questions started to arise: How does evolution shape developmental processes? How can development be modified by the surrounding environment? How can we take advantage of the plasticity of development? Today, Developmental Biology is a highly-regarded field of study, being a course requirement of most undergraduate programs in the biological sciences. But why did we, as young scientific investigators choose it as our research discipline? We all agree: when you first observe a developing organism under the lens of a microscope, the entire world becomes fascinating. We see life’s great questions in our work. For instance, when does a cell leave it’s past behind and enter into it’s destiny? What makes a cell unique? What are the costs of differentiation? Could it be immobility, like for osteocytes; or programmed cell death, without which the fingers would not exist; or perhaps pruning, like what more than half of the brain’s synaptic connections undergo to achieve functionality. Then there are the milestones. In one of our seminars by Prof. Roberto Mayor, we were given to ponder the famous quote by Lewis Wolpert, that it is “not birth, marriage or death, but gastrulation which is truly the most important time in your life”. With such intriguing insights into the facts of life, how could any other subject area compare? Simply exploring your surroundings in Latin America leaves one searching for answers. With unique habitats holding nearly one-fifth of the world’s plant and vertebrate species (Myers et al., 2000), it has been called “a living laboratory” and is a place of continuous discovery. This was made evident to us, by exploring just a few meters on the coastal shore of the Quintay waters, where we observed a great diversity of organisms, protected between the rocks before being revealed under our microscope lenses. Unfortunately, human activities that trigger climate change, diseases, and species introductions are affecting natural ecosystems. So we are given the challenge to find new research models to discover unique molecular and cellular mechanisms before they are lost entirely. Several research groups such as Dr. Alejandro Sánchez-Alvarado’s lab are investigating emerging model systems which may help us to overcome types of illness and injury not possible today. Despite the benefits of conducting Developmental Biology research in Latin America, the reality is that resources and funding are limited. Countries that have an established tradition of scientific investment such as Brazil, Argentina, Mexico and Chile (Marcellini et al., 2017) are more equipped than others; however, careful experimental design, collaboration and creative problem solving are essential. All of us came with different backgrounds: free or paid access to undergraduate studies, different levels of research experience, different levels of English fluency, among others, which showed us the challenges that everyone was going through in the road to pursuing our dream of becoming scientists. However, all of these differences were set aside during the two-week course. The appreciation of the personal value of each participant and faculty member, the willingness to help each other, the equality with which the faculty and participants exchanged ideas was indicative of the underlying message of this course: advance together as one. As scientists who study the transient process of life as it acquires it’s form and function, we are part of a minority that has the knowledge and the opportunity to make the world a better place. With climate change, wildlife extinction, food and resource crisis at our doors, difficult times are ahead of us. It is our responsibility to observe what is going on around us, make predictions, test hypotheses, and not simply resign ourselves to the way things are. We must share our knowledge, explain science and impact our society. It is in our hands to spread scientific knowledge to the general public and especially, to future scientists at a young age. This can be achieved by creating outreach programs, such as the television series that Dr. Kate Whitlock created, La Alegría de la Ciencia, which can stimulate children and adults to be interested in Developmental Biology. Science must be inclusive and not limited to scientists. Funding reviewers and government decision makers also need to be informed about our work. Here it is our duty as Developmental Biologists to explain that our research is more than simply “basic science” with no significant contribution to solve current problems. Rather, it is through studying processes such as cell migration, epithelial-mesenchymal transition, control of gene expression, and cell death that we can solve problems in reproduction, development, disease, aging and regeneration. The personal and professional experiences of this two-week happy confinement in Quintay are some of the most illuminating and transforming that many of us have. Although separated now in different countries and continents, we have shared unforgettable moments of life and learning in this course and the doors were left open to continue working together in the future. We go forward knowing that we CAN make a difference if only we keep pushing towards a better future. Group photo, taken moments before getting soaked by an incoming wave. Bottom row, left to right: Emma Rangel Huerta, Angelly Vasquez, Mateus Antonio Berni, Lorena Agostini Maia, Jessica Cristina Marin Llera, Nancy María Farfán, Nipam Patel. Middle row, left to right: Lautaro Gándara, Jennifer Giffin, Maria Belen Palacios, Luiza Saad, Estefanía Sánchez-Vásquez, Jorge Antolio Domínguez-Bautista, Adrián Romero, Roberto Mayor, Raymond Keller. Top row, left to right: Fernando Faunes, John Rojas, Sandra Edwards, Elias Barriga, Lucía Bartolomeu, Eugene Tine, Soraya Villaseca, Paula M. González, Matías Preza, Maria Fernanda Palominos. “A continent whose thriving biodiversity represents endless forms most beautiful and most wonderful that are a source of inspiration and opportunities for the Evo-Devo community” (Marcellini et al., 2017). Written by the participants of the 2018 International Course on Developmental Biology. Marcellini S, González FA, Sarrazin AF, Pabón-Mora N, Benítez M, Piñeyro-Nelson A, Rezende GL, Maldonado E, Schneider PN, Grizante MB, Da Fonseca RN, Vergara-Silva F, Suaza-Gaviria V, Zumajo-Cardona C, Zattara EE, Casasa S, Suárez-Baron H, Brown FD. (2017). Evolutionary developmental biology (Evo-Devo) research in Latin America. J. Exp. Zool. (Mol. Dev. Evol.) 328B:5-40. Myers N, Mittermeier RA, Mittermeier CG, da Fonseca GAB, Kent J. (2000). Biodiversity hotspots for conservation priorities. Nature 403: 853-858.